Have a heart. No, literally, have a freshly butchered heart. They are rich in protein and sodium, or so the nutritional facts say. 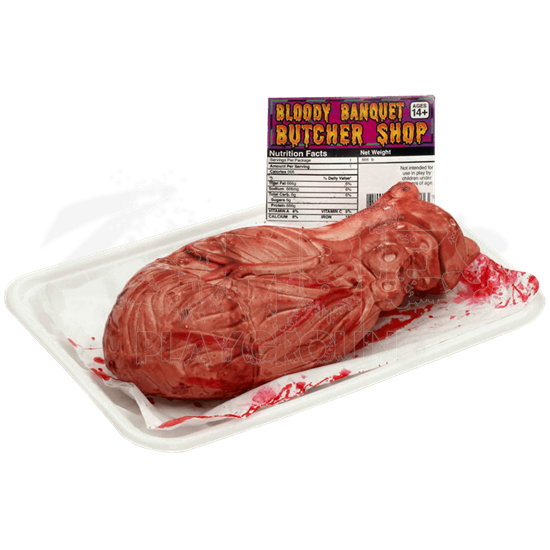 The Butcher Shop Heart is a novel and disturbing cut of meat served up on a white butcher tray. Of course, only a zombie or a cannibal would look at this cut of meat and begin to salivate, but what is wrong with a few items that are targeted towards the walking dead? This heart looks like it was expertly cut out of the chest, the organ featuring very little damage or unnecessary cuts. It has a pale pinkish color that is appropriate for a well-used muscle and is covered in spatters of blood, to moisten the meal for any zombie who decides to take a bite. The heart sits on a white butcher tray, where a sheet of white paper soaks up the blood that drips off the heart. The heart is made from latex, while the white tray is made from plastic. The heart measures 6 inches long and 3 inches wide, while the tray measures 7.25 inches long and 5 inches wide. Even a living person might find a good reason to keep the Butcher Shop Heart sitting around in their refrigerator, like the need for a replacement heart. Of course, it goes without saying that it also makes a fine zombie snack, and therefore, good zombie bait as well.